There were no signs of foul play in the death of an Australian Instagrammer working on a yacht in Greece, coroners have told Australian media. It is believed Sinead McNamara, 20, took her own life. She was found in a critical condition by other crew members aboard the Mayan Queen IV last week and died while being airlifted to hospital. Her body is now due to be flown home to Australia by her family, who had been on their way to visit her. Greek police have said they do not believe her death was suspicious and have since allowed the boat to leave the island of Kefalonia, where it had been docked. The super-yacht is owned by Mexican mining magnate Alberto Bailleres, who is reported to have left the vessel days before her death. The Greek coroner's office has confirmed to several media outlets that there were no signs of violence on her body but added that toxicology results were pending. 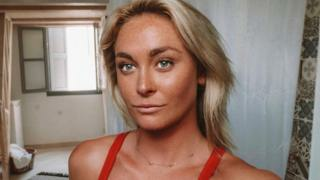 Ms McNamara, originally from Port Macquarie in New South Wales, regularly posted pictures of her travels to her Instagram account, where she had thousands of followers. Her mother and sister were on their way to Greece to visit her when they received news of her death, reports say. Fans and friends have paid tribute to Ms McNamara online in the days since her death. If you are in the UK and are struggling to cope, you can call Samaritans free on 116 123 (UK and Ireland) or visit their website to find details of their nearest branch. For more information on emotional distress, click here.